Hope this is acceptable here if not, let me know. 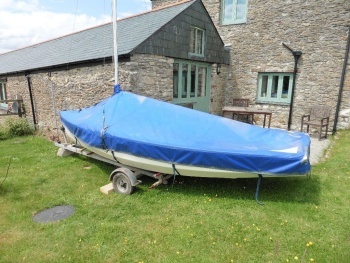 I am selling my boat which is in very good condition and ready to sail. About the boat... the 7215 is the original number, I have another set of sails (main and jib) that aren't the original ones (still reads 7215). It comes with a spinnaker that I've never used as it gets way over my sailing experience quite fast! So all sails are there and you have a spare set. 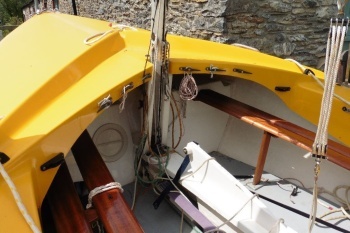 The centreboard has been painted white after the last sailing trip so that is in very good condition. The rudder is all there and in very good condition. The rigging is all there and I have rigged it for 2 users. The hull is in very good condition. There is a small repair on one side of the hull above the waterline, never had problems with it. The boat doesn't take in water even when fully loaded (5 people + camping gear for all). (Don't ask me how I know, please... never again). The interior has been refurbed by me. New floorboards cut to size, painted and dry sand under the last layer of paint so there is enough grip in the boat to not crack any ribs. It looks very professional and very effective. The straps were reattached as these were all loose. All the benches were refurbed as nails weren't holding them together, all the screws were tightened all around the boat to make sure all is as should be. This boat comes with 2 trailers (2 in 1 basically so you tow them both together). One is a road trailer and the other, the launch trailer. The road trailer had the wheel bearings changed with SKFs as these were noisy. The launch trailer had the tyres changed and you have a spare road trailer wheel and tyre and some other spares like a launch trailer tyre and tube. 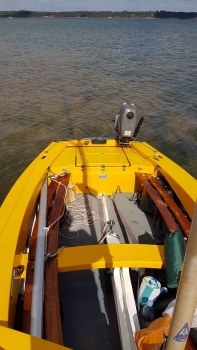 The jockey wheel is present so you can launch the boat with ease without getting any of the road wheels into the water. I had an amazing fun with this boat and learned a lot with it. I took it out in the open sea and it was amazing. 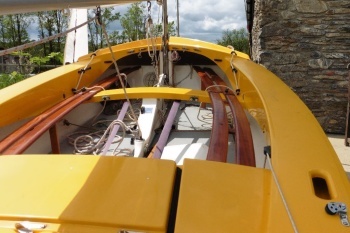 It’s a very good boat which is ready for the water without needing any work. The outboard Suzuki DT5 engine is not included as this engine is not mine and I need to return it to its owner. Please ask me anything about it. I might be able to answer. I have had this boat at 3 different addresses in 3 different cities and it was never a problem to store it. 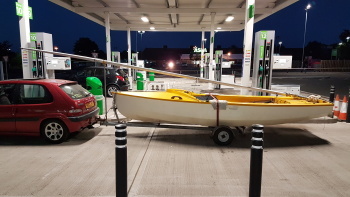 Easy to tow by hand even by just one person if you can't get the car in with the boat attached. Looks good. 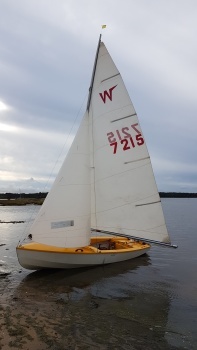 I learned to sail in a Wayfarer. Good luck with the sale. What's the length of it George? The boat is around 15 ft long. The trailer will increase that length by a bit. I had it parked in Coventry in a residential area in front of my house. Had it next to the drive, on the drive, on the front lawn, around the back. Everywhere as I moved around quite a bit. It is not that bad to store it. Hope this helps. I've done it up after my last day out in it... was supposed to go one last time last year and I got it in a perfect state for the next trip. Never got around to go again before the weather turned bad. It tows beautifully behind my Saxo. It's a really good boat. 5V. It can charge your phone if you have a power bank. 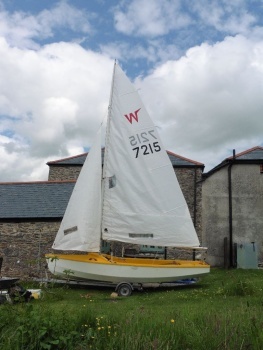 I used to sail a Laser and we had a club member with a Wayfarer. He was around 20 stone and could never get a decent crew. 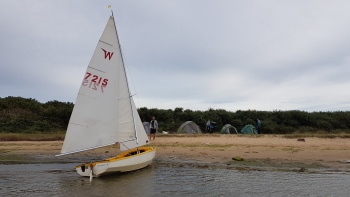 One race day, it was blowing an absolute hooley and I decided not to sail my Laser, so I crewed for him. "Just tell me where you want me", I said. A lot of sailors are a bit finicky about this! "Anywhere will do, just get comfy", he replied. The race was carnage, capsized boats all over the show. It was the first race he ever won, mainly because we stayed upright. After the race, other sailors congratulated him on the win. "Arrr, good sail", he said. "I had to sit out a couple of times." Never managed to capsize it! I did ”fill” it with water by mistake two times but never really managed to capsize it. I really love this boat... 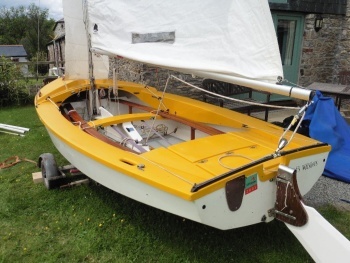 I am happy I leaned to sail on it, no experience, no nothing, just some YT videos and practising in Pool Harbour. Rigged it twice hooked to the car so I know what to do on the water. First time sailing and 10 minutes in, I got into a race course that I did not anticipate. I was the only boat different than those of that sailing club (25 of them ). It took me 5 minutes to get out of there and 4 near misses... I was sweaty, knackered and laughing. I learned a lot during those first 15 minutes of me sailing. 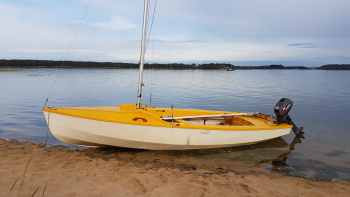 I used to be a Powerboat Instructor and we used to deliberately capsize them. They were a piece of p!ss to right. Not like these modern things that just fall over again. Bailing them out was another story.